While this subject line generally makes me think of the lottery pool, it has taken on a much bigger meaning for me today. I’m sure I have made you all painfully aware of the fact that I finally finished writing my first novel. Book number two is in the works and the idea for number three is a shimmering light in the distance. I thought that the actual writing of the book was going to be the hardest part. And while it was a painstaking process, never having attempted to write a book before, the writing itself was a reward. The hardest part is convincing yourself that someone else may find your words exciting enough to take you on as a client and help to get you published. I spent my day off today, a beautiful, sunny day, bound to my couch to finish editing my book for grammatical oversights and story continuity. I was just as excited to read the ending as if I were a first time reader and that got me even more excited. I was excited enough to send my first two query emails to potential agents…..and now I feel nauseous. But like that lottery pool, you can’t win if you don’t play. I will never get published if I don’t try, and according to Yoda, there is no try, only do. So I did. Now I can only hope that some unsuspecting agent finds an email from a small town Canadian girl with big ideas and gets just as excited to read it as I was to write it. Today began as nothing special. But my nothing special day changed drastically when my car made the familiar turn onto my road after doing some shopping on my day off and I casually glanced along the macadam leading to my house. What I saw on the road made me do a double-take and tears instantly appeared in the corners of my eyes. A random woman, a stranger, was walking her two small dogs, one black and one white, down my road and for a split second I could have sworn it was my mother. When she was still alive, my mother chose to park her car in my driveway and walk her two small dogs, one black and one white, on my road because it was a manageable, quiet street. When I came home from work, I would see the silhouette of my mother and her two sidekicks as they simultaneously pulled her in a myriad number of directions. It was a struggle for her but she walked those little dogs until she could walk them no more. Before I realized it, I had come to a complete stop and simply watched this woman walk away from me. 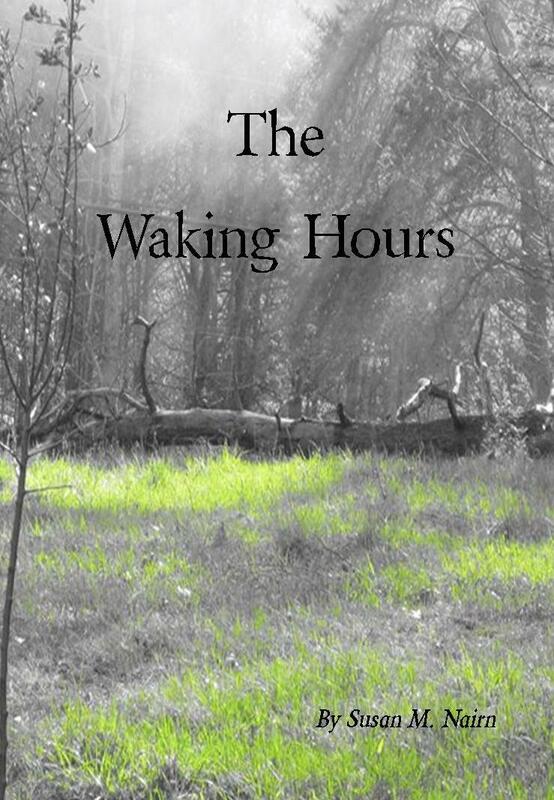 I don’t know how many minutes passed before the fading contour of her shadow turned onto the side road and disappeared. The clock of my nothing special day stopped and I couldn’t move. I could barely breathe. The hopeful part of me anticipated that the woman would turn around and come back. The stubborn part of me was willing to sit in the middle of the road until she did because the child in me thought for a split second that my mother would be the one to round that corner on her way back. Eventually I collected myself and pulled my car into my driveway. 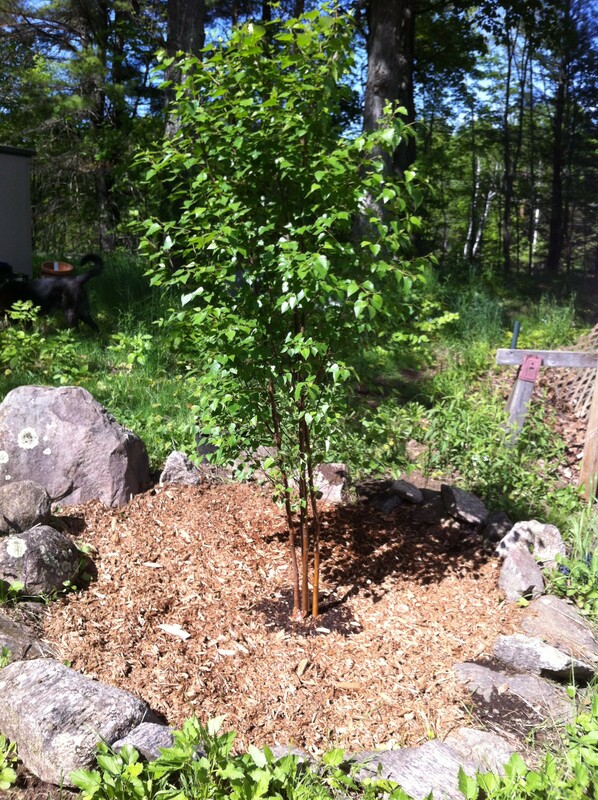 I was already on the verge of an ugly cry so I stood in front of the Birch sapling I planted three years ago in her memory and nothing could stop that surge of emotion from escaping. But the cry was much shorter than I anticipated. As I looked at that Birch tree, now almost double the size it once was, I realized that life does go on. We endure many hardships, we suffer through tough times, but beauty always has a way of sneaking back into our lives, even when we think the best things in our lives have been taken. Life evolves. Life is about birth, growth, love and death. But life is also about remembering, cherishing, holding on to memories and carrying on. Life is about chance encounters, reconnecting with friends, deja vu and finding new things to love. And life is about knowing that you were once able love something so much that it physically hurts when you keep remembering that it is gone forever. Life is about a lot of things but, good or bad, life still happens every day. I am just thankful that I am able to wake up each morning, engage with the people I still have in my life and spend time remembering those who have been able to emerge from their eternal cocoon and spread their wings in a new reality. Life is about a lot of things. But most of all, life is about finding some happiness in the saddest part of your day. Last year, I made the courageous decision to let two of the guests at the lodge read the first three chapters of my novel. It was a large hurdle for me to jump, to trust my writing enough let them read it and, as I sat waiting to hear back from them, I was concerned that their critique may destroy the hope I had for my book. I was dead wrong and I wrote about it here. That same couple checked back into the lodge yesterday for their annual “Shammy” vacation. I was delighted to see them again and we embraced like we have known each other for decades. We had been corresponding by email over the winter and they were two of the people at the top of my list to share my news once I had finished writing the book. As she began to leaf through the 8 1/2 by 11 pages, I watched her brow furrow. She agreed with the changes that I had made in red ink but I sensed there was an underlying urge in her to be wielding the same red pen she had used last year. Instead, she set the pages down on her lap and seemed so overjoyed that I had finished my work in progress. She was thrilled and her joy seeped into me. I was elated. The excitement I had felt after finishing the writing now came flooding back and the two of us acted like we had just won the lottery. 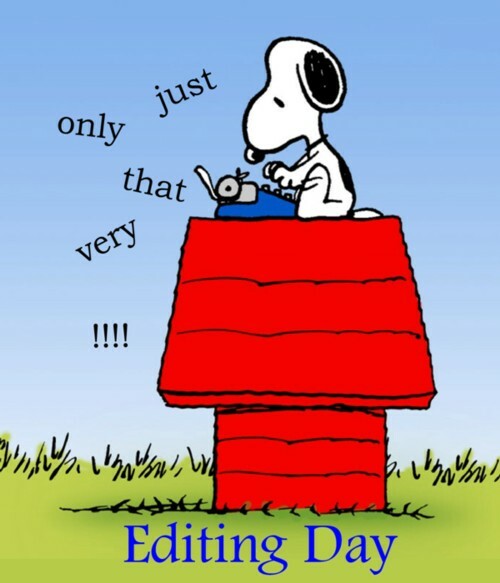 I have been dutifully editing my novel for egregious grammatical oversights as well as making the story flow as well as it should so the reader is not lost at the beginning of any of the chapters. I plan to spend all of my free time over the next week finishing the revisions and beginning the hunt for an agent. Game on! 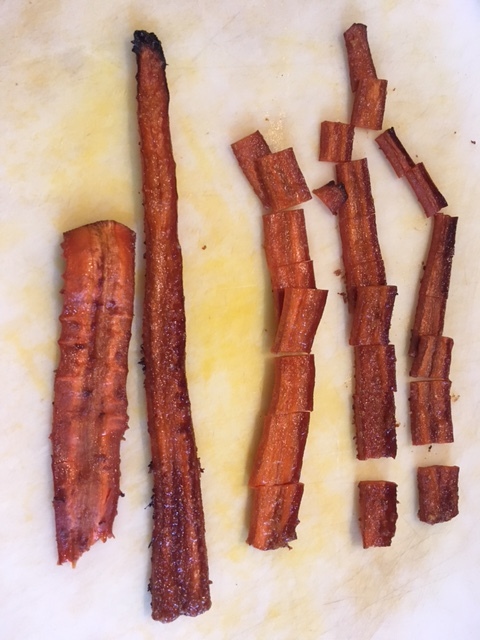 I have two words for you – carrot bacon. Coming from a professed meat lover, I know these two words will shock and amaze you but I have just made my first batch today and will continue to do so. It was delicious! My foray into more of a vegetable and plant-based world has been encouraged by a friend who has recently decided to eat a Vegan diet. I am supportive of his decision and I am hoping that his food choices will help him alleviate some of his medical anomalies. In his quest to research his new eating style, he has sent me several videos on the topic and they have been very interesting, to say the least. For a woman somewhat shy of fifty, I have noticed my body does not react well to the foods that were once digested without a second thought. Bloating is a common complaint so I decided to investigate a plant-based diet and give it a try. I am not confessing to becoming a Vegan but I am going to give this new lifestyle a fair shot and see how I feel after a couple of weeks. Food plays a huge role in our lives. In our twenties, we could eat whatever we wanted. In our thirties, we became a little more conscientious and made better choices. In our forties and fifties, we become sadly aware that we are no longer in our twenties and thirties and our lifestyles have to evolve. I am excited to venture into this new chapter of healthy eating and thankful that the internet is a wealth of knowledge when it comes to recipe ideas. 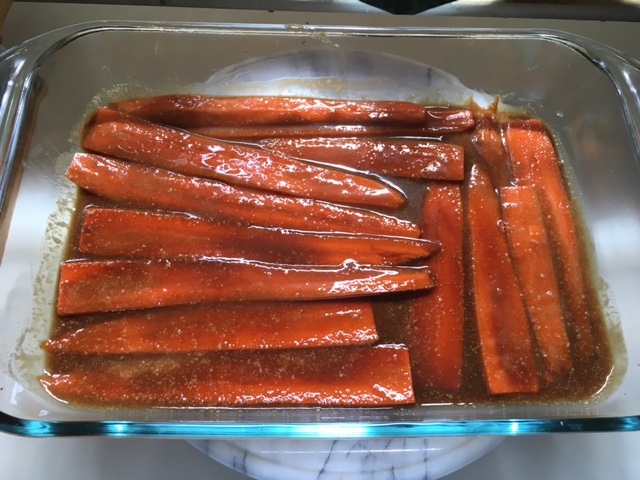 The carrot bacon is done. The pistachios, walnuts and almonds are toasted. The breakfasts and lunches are prepared for the next few days and I am eager to find out how this journey evolves and how my body adapts to the changes. My first two plant-based dinners were a huge success and I felt full without feeling sluggish. That to me is a huge step in the right direction. I am not committing 100% to the Vegan diet. I may have the odd meal that may not be entirely plant-based but I am willing to commit to taking this new journey one day at a time. If it improves my health and well-being, I’m willing to give it a try. Moods are contagious. When a mood is allowed to live and feed on the energy from which it was born, it is given the power to grow exponentially and infect everyone around it, like a slow-acting poison. That mood can seep under the skin of unsuspecting people and change the trajectory of their day. 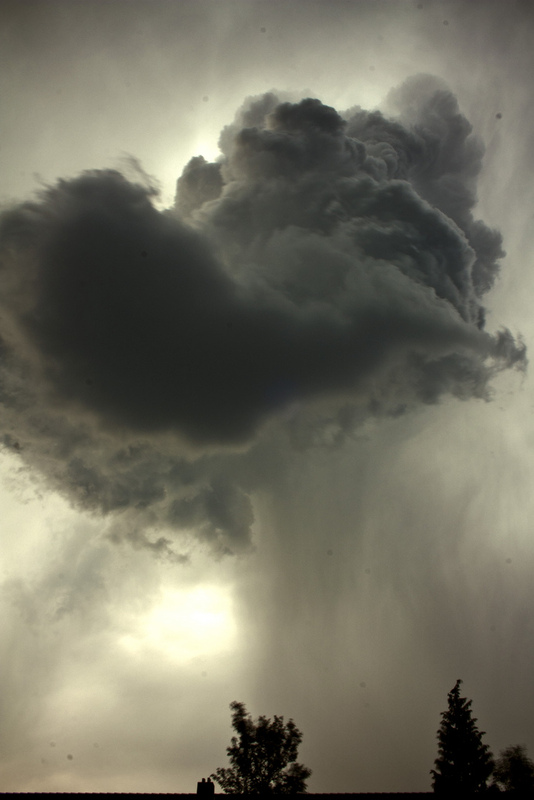 Last week, one dark cloud hovered above my surroundings and it spewed forth its acid rain. What started as a relatively happy day slowly spiraled into a morning from Hell. I was astounded at how quickly one bad mood could leech itself from its host into every organism with whom it came into contact. I bore witness to a malignant energy infecting everyone in its path. A quick discussion with my superiors resulted in temporarily removing the poison from our work system and eventually the day became much brighter. Within minutes of the cause of the discomfort leaving building, calm was restored and the dark cloud was lifted. The miserable rain ended and the sun began to shine once again. Although it may be a small cloud in a vast sky, one dark cloud can rain on everybody. We just need to be strong enough to blow that cloud into a different sky.